What would you give to sit down with some of the most influential youth workers in the country? Not just the big names but those individuals who have proven time after time that they have a passion for reaching teens today that is pushing the limits of traditional youth ministry? 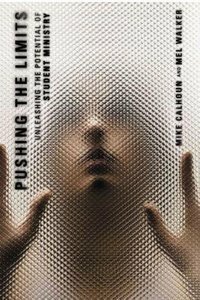 In Pushing the Limits, veteran youth workers Mike Calhoun and Mel Walker have collected some of the best writing from youth pastors and leaders in churches big and small around the country who are doing what it takes to tap into the true potential of youth ministry. They give you the opportunity to find out what these youth leaders are doing that is making an impact and put it to work in your own ministry. Mike Calhoun has served with Word of Life Fellowship since 1974 as a State Missionary, Southeast Regional Director, National Staff Director, and now serves as Vice President of Local Church Ministries for North America. A dynamic and articulate communicator who is daily ministering to the needs of young people and adults across North America, his responsibilities include overseeing a missionary staff who minister to over 1300 local church ministries. He has a degree in Bible from Tennessee Temple University and has done graduate work done through Columbia Theological Seminary. Mike preaches both nationally and internationally in churches, youth events, leadership conferences, and colleges and seminaries. Mel Walker has been Director of Student Ministries at Regular Baptist Press since 1998 and has led in the complete revision of RBP's junior high and senior high youth curriculum. He is also the president and co-founder of Vision For Youth, Inc., a national network for youth ministry. Mel is a frequent speaker at conferences around the world and has organized regional, statewide, and national youth conferences. A graduate of Baptist Bible College and Seminary in Clarks Summit, Pennsylvania, he has done graduate work at Iowa State University and Faith Baptist Theological Seminary. He currently serves as an adjunct faculty member at Baptist Bible Seminary and Northwest Baptist Seminary in Tacoma, Washington.